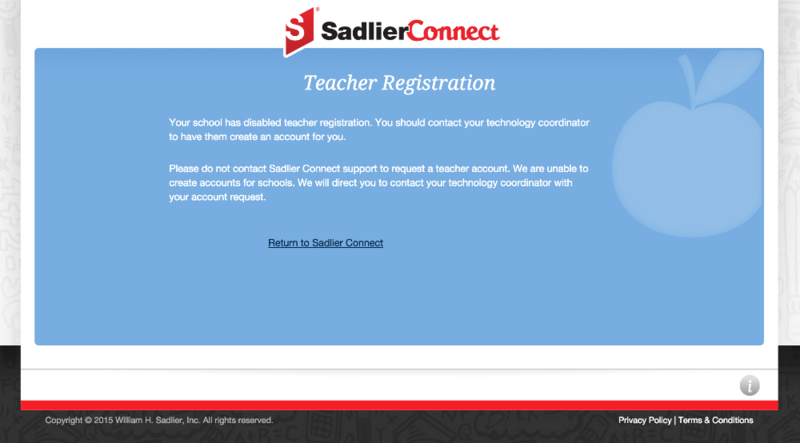 Sadlier Connect allows for schools to turn on or off the teacher self-registration. In general if a school has ordered a digital product, the teacher self-registration is turned off. This is because a school administrator will generally setup all the accounts. You should get in touch with your curriculum or technology coordinator at your school. If an account has not already been setup for you they can create one for you. Below is a screen shot of the disabling teacher registration message that you might have encountered. We are unable to create an account on your behalf or re-enable teacher self-registration. You must go through your curriculum or technology coordinator.